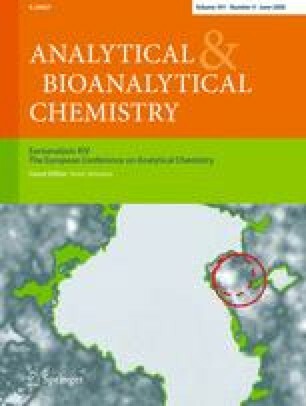 A novel thermal desorption technique using a direct-probe device (Chromatoprobe) attached to a gas chromatograph–mass spectrometer is presented for the thermal pretreatment, characterisation and analysis of molecularly imprinted polymers. The technique is demonstrated as effective for the removal of volatile materials, including template and unreacted monomers, from methacrylic acid–ethylene glycol dimethacrylate copolymers imprinted with 2-aminopyridine. Mass spectrometry is a powerful technique for polymer bleed characterisation. Thermal desorption studies on reloaded template and related compounds are reported as a means of assessing polymer morphology, specific binding by imprinted polymers compared with reference non-imprinted polymers and selective binding by an imprinted polymer for its template. Calibration studies on the thermal desorption technique using an internal standard are presented with R 2 > 0.999. The technique provides a novel method for assessment of polymer thermal stability, composition and morphology. Financial support of this work from the Technological Sector Research Initiative (2001) (Strand 111) is gratefully acknowledged.